What Is a Tax Deferred Retirement Plan? You may have heard certain retirement plans referred to as “tax-deferred,” but what is a tax deferred retirement plan? Before deciding how these accounts may fit into your overall retirement savings, you’ll want to understand what tax deferral means, how it compares to other types of retirement accounts, and what some of the other features of tax-deferred accounts are. Once you have all this information, you’ll be able to understand the options available to you and increase your odds of achieving your retirement goals and decreasing your taxable income in retirement. Tax deferral put simply means that you are paying taxes on the funds in your retirement account once withdrawn, not prior to depositing them in the account. When you have a traditional 401k, 403b or similar plan in the workplace, for example, your contributions to the plan will show on your pay stub as a pre-tax deduction. It’s like to the deduction for any portion of your health insurance premiums that you are responsible for. Similarly, when you contribute to your own traditional IRA outside the workplace, it will (subject to certain limits) be an adjustment when you file your tax return since you make the contribution directly rather than having the contribution withheld from payroll. The result is the same, you will not pay taxes on the funds today, but will do so when the funds are withdrawn during retirement. This is only a partial list of some of the available tax-deferred retirement plans that are common in the United States. Some of these plans may also allow for Roth contributions, which we’ll also address for comparison purposes later. How am I taxed at withdrawal? You won’t be taxed on activity occurring inside the account along the way, such as selling assets or receiving interest and dividends. This allows the funds to more effectively compound over time while inside the account. When you withdraw your funds in retirement, you’ll be taxed at your ordinary income rate. This means that you will pay federal and state tax (if applicable in your state) at the rates that apply to other types of ordinary income such as wages from employment. The future tax brackets at the time of your retirement as well as your income from retirement accounts and other sources will determine the amount of taxes you will pay on withdrawals. This rate may be higher or lower than the rate of tax you saved at the time you made a pre-tax contribution. Tax-Free: A common example is money contributed to Roth IRA or other tax-free account types. You don’t receive a tax deduction for your contribution to the plan (i.e., it’s made with “after-tax” money that you’ve already paid on) but the funds, as well as any growth, will be free of tax upon withdrawal. Taxable: When you invest money you’ve already paid taxes on in an account type that does not have tax free status upon withdrawal (your individual account, a joint account with your spouse, etc.) you have money in the “taxable” pool. Often if certain conditions are met, you can receive the “investment rate” of tax on activity such as capital gains and dividends, which is more advantageous than the ordinary income rate. Unlike tax-free or tax-deferred accounts, you’ll be taxed when activity occurs. This means in the year you have capital gains, receive interest or dividend payments, not when you choose to withdraw the proceeds of these events from the account. Also, unlike money in tax-free and tax-deferred accounts, the tax management of the specific investments you hold will be important to consider. Many retirement savers find the wide variety of choices available to them intimidating and confusing. 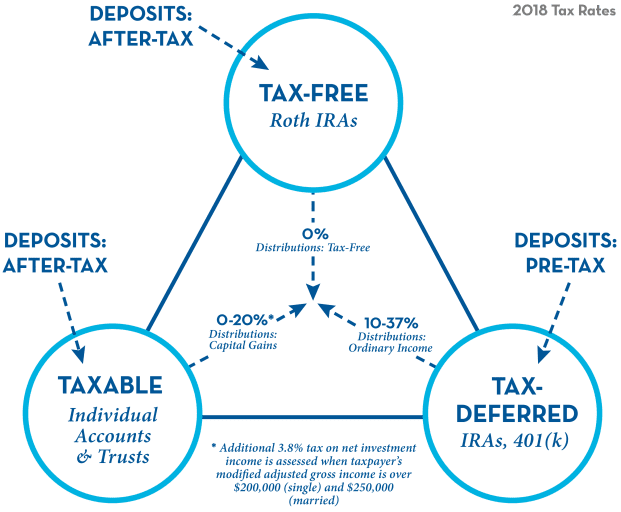 Should I have a tax free or tax-deferred account? Maybe just a regular taxable account? It can feel like you need a crystal ball to make the decision based on where your own income and future tax rates are at the time of your withdrawals. The good news is that you don’t have to predict the future. Tax-deferred accounts are powerful tools for retirement savings, but so are the taxable and tax-free pools. By having money in each, you’ll have more flexibility in retirement to take your withdrawals from the account types that make sense at the time. This is tax diversification, one of the most important topics in retirement planning. For assistance with your decisions, please consider working with a qualified professional to help with the process.